Special Reports - American Politics, How Bizarre it Is? You think such a man could not be president? Stifle that disbelief! An NBC News/Wall Street Journal poll at the beginning of this month suggested otherwise. When Republican and Republican-leaning primary voters were asked whom they would favour as a presidential nominee, Mr Trump scored 17%, sharing second place with Mike Huckabee, ahead of Sarah Palin and not impossibly far behind Mitt Romney, the front-runner, who was favoured by 21%. Since then his numbers have risen. A poll published on April 14th by Public Policy Polling put Mr Trump in the lead, with 26% to Mr Huckabee’s 17%. Mr Trump has another big thing going for him. He was born in the United States, and he has the birth certificate to prove it, having paid New York the $38 required to have it sent to him. Until recently he thought that Barack Obama was born in America too, but now he is not so sure. Mr Trump has sent a team of investigators to Hawaii to look into the issue. But, in the meantime, he is positive that Mr Obama’s first book, “Dreams From My Father”, was written by Bill Ayers, the Vietnam-era terrorist. That book, after all, was “Ernest Hemingway-plus”, whereas the second book Mr Obama claims to have written, “The Audacity of Hope”, was plainly written by “someone much more average”. Here, perhaps, is one secret of Mr Trump’s success so far. Though it is obvious that he is no fool, he has no fear of saying foolish things. People are used to it. Indeed, he seems impervious to criticism of almost any kind except of his remarkable hairstyle (or, the unkind aver, his hairpiece). At public meetings or in television interviews he brushes off boos, taunts and evidence with a supreme insouciance. He has little to lose by flirting with politics, and, when you think about it, rather a lot to gain. No matter how he made his claimed billions, a part of his fortune depends now on his celebrity. Hence the appeal of another shot at politics. Outrageousness begets attention, being well-known helps you to run for president, and threatening to run for president makes you more famous still. As in the case of Mrs Palin, a whole sub-branch of psephology is now dedicated to figuring out whether Mr Trump is “serious” about running or merely burnishing his brand. Now re-engage your disbelief. Polls taken this far before a primary campaign are notoriously useless. Mr Trump’s sudden good showing may say more about the weakness of the rest of the present Republican field than his own strengths. Though he has deep pockets, spending a fortune is not decisive in small states that take their caucuses and primaries seriously, such as all-important Iowa and New Hampshire. And trying to outflank them, like Rudy Giuliani in 2008, has proved a weak strategy. 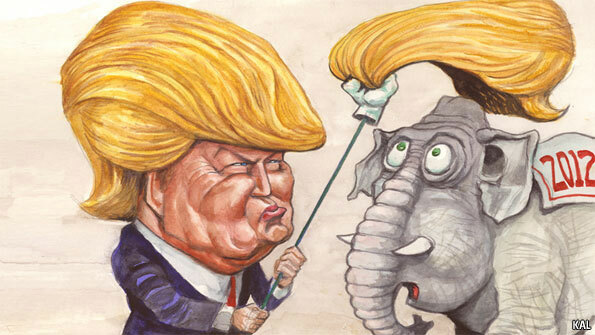 Once serious Republicans take a closer look at Mr Trump, they are liable to be unimpressed. Like his party affiliations (he has in his time been a Democrat and a member of the tiny Reform Party as well as a Republican), his policy positions have meandered all over the place. In a book he wrote in 2000 while angling for the Reform Party nomination, he praised Canada’s single-payer health-care system. This is anathema to most Republican voters, who think Obamacare radical enough. In short, for all his undoubted entertainment value, there is virtually no chance of Mr Trump becoming president. Thank goodness. Copyright © The Economist Newspaper Limited 2011. Reprinted from The Economist of April 20, 2011.